In Vancouver Island’s Oceanside region (map), the Qualicum Beach and Parksville BC golf courses await. You are invited to golf Parksville‘s fantastic trip of courses – and explore one of the finest marine environments on the island. These three courses are all ripe with character and provide for excellent experiences for golfers of all ability. Designed by architect Les Furber, Fairwinds Golf Club is a tucked-away haven that caters to boating enthusiasts and golf-lovers alike. Fairwinds is more than a golf course: it’s a stunningly beautiful coastal community with gorgeous beaches, rivers, and waterfalls. Sailing, fishing, and kayaking adventures launch from the marina and miles and miles of trails invite hikers and cyclists to explore the Nanoose Peninsula landscape. The 18-hole layout at Fairwinds is easily one of the most scenic courses on the island and is said to be the kind of experience that can change the direction of your life. Qualicum Beach golf course Pheasant Glen is one of the island’s best. Recent and future National and Provincial Men’s Championships in 2016, 2018, 2020 (Canadian Senior Men’s) speak to the Championship layout and conditions. Pheasant Glen Golf is a 6,928-yard course par 72 (par 71 from Championship Tee) devoted solely to great golf in a stunning natural setting. The front nine winds through high grass, meadows, and creeks, all framed by the peak of Mount Arrowsmith. The back nine winds through a heavy stretch of Douglas fir. A well-earned reputation for great greens and overall conditioning make Pheasant Glen a must play. Just 25 minutes north of Nanaimo, you’ll find one of the island’s best-kept secrets, Eaglecrest Golf Club. Discover this enjoyable, 18-hole, par 71 championship golf course featuring towering fir and cedar trees, winding fairways, and year-round golf play. 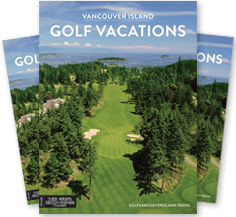 Explore our Parksville & Qualicum Beach Golf Packages, call our toll free number and talk with a Golf Vancouver Island representative, or have fun creating your very own BC golf vacation quote in our “Free Instant Quotes” and read up on 5 Tips for a Relaxing Golf Vacation. Victoria and Vancouver Island offer superb golf and much more. Planning a golf getaway? This island destination is on the ball. Staff were knowledgeable and helpful in the booking process. Made good suggestions and recommendations for courses to play.